Inter Faith Week 2017 has started! Find all the events taking place in your borough on the Inter Faith Week website map. There are quizes, visits, discussions on hot topics, meals and gatherings across the capital all week, some hosted by borough councils. If you haven’t added your event to the IFW website, there’s still time. Above: two members of the Christian-Muslim women’s group in Wandsworth. Today: follow #HOBV9 to keep in touch with Wandsworth Community Empowerment Network‘s annual Black Mental Health event, Healing Our Broken Village, at New Testament Assembly Church in Tooting, SW17. If you’re able to join the conference, which includes the CEO of South West London & St George’s Mental Health Trust and Royal Holloway’s Dr Frank Keating, all the details are here. Saturday 28 October: Kingston Study Day – Understanding Islam with Dr Chris Hewer, an exploration from predominantly Christian and Muslim perspectives, at the Milaap Centre, Acre Rd, Kingston, KT2 6EE. For beginners and the knowledgeable alike – all welcome. Download details here and contact Diana if you would like to participate. Thursday 2 November: opening of a new venue for Greenwich Peninsula’s Multi Faith Prayer Space at the Aperture Building on Greenwich Peninsula, 42 Chandlers Avenue, SE10 0GE. The Prayer Space provides a venue for faith groups to meet for prayer and worship and is available for booking by faith groups for their own prayer or worship activities. The Prayer Space is also open every day for people to drop in for prayer and reflection. The Community Room provides a facility for activities or events which build up the local community and is available for booking by individuals or groups for such activities or events. Find the details here. Saturday 4 November – Sunday 5 November: With God on Our Side… Religion and War, with talks, panels and debates including Holy Wars, Is Religion Inherently Violent (with Karen Armstrong) and War and Peace in the Middle East, at the Southbank Centre, Belvedere Road, SE1 8XX. Monday 6 November: St Martin-in-the-Fields, Trafalgar Square – Reforming Attitudes to Islam, with Prof Mona Siddiqui and Joshua Ralston of Edinburgh University. Monday 6 November: second in LBFN’s safety, security and resilience four-part course for places of worship, hosted by New Scotland Yard and supported by the Corporation of London. Contact LBFN for further details. Sunday 12 November: Harrow Interfaith‘s Remembrance Service at Harrow Civic Centre War Memorial at 10.30am. Monday 13 November: Barnet Multi Faith Forum launch an exhibition “Love Your Neighbour – Muslims who rescued Jews during the Holocaust” at Middlesex University Quadrangle, the Borroughs, Hendon NW4 4BT. Details here. Monday 13 November: Quiz night – A Question of Unity with Faiths Together in Lambeth at the Karibu Education Centre, 7 Gresham Road, SW9 7PH. Details here. Tuesday 14 November: Tower Hamlets Inter Faith Forum, “Faith & Communities” at The Royal Foundation of St Katharine, 2 Butcher Row, E14 8DS. Details and booking here. Tuesday 14 November: Redbridge Faith Forum ‘s Come to Dinner with RFF! Interfaith Buffet at Ilford Islamic Centre. Details and booking details are here. Tuesday 14 November: Youth debate with Islington Faiths Forum, “How can we have harmony in a multifaith community environment?” at Platform, Hornsey Road Baths, 2 Tiltman Place, N7 7EE. Saturday 18 November: Hounslow Friends of Faith presents, “The Bundle – an asylum seeker’s story” at Brentford and Isleworth Quaker Meeting House, Quakers Lane, London Road, Isleworth, TW7 5AZ. Details and booking (performance is free but must be booked in advance) here. 12 – 19 November is Inter Faith Week 2017: plenty of events taking place in London this year – find them on the map and add your own. Monday 20 November: third in LBFN’s safety, security and resilience four-part course for places of worship, hosted by New Scotland Yard and supported by the Corporation of London. Contact LBFN for further details. Looking ahead, #VisitMyMosque Day is on Sunday 18 February 2018 – more details on how to plan for the day can be found here. From Neighbourhood Renewal to Big Society, from mental illness to hate crime, from 9/11 to integration, PCTs to CCGs, Stop & Search to SNPs, interfaith walks & WhatsApp groups – such a lot has changed! Join us tomorrow evening 5.30pm-7.30pm as we chart the massive contribution that local gurdwaras, synagogues, mosques, temples and churches have made to the wider community and the key contribution of local multifaith networks and forums working in partnership with councils, the NHS, local police & fire services. Add your significant dates to our timeline (it will be posted online soon), hear from faith forums & public sector officers across the capital and be part of an engaging debate on the current context. With us will be practitioners from Kensington & Chelsea, Harrow, Wandsworth, Hounslow, Islington, Tower Hamlets, Richmond, Lambeth, Havering, Westminster, Southwark, Barking & Dagenham, Redbridge, Enfield, Croydon, Barnet & the City, with borough London Resilience managers and local police officers. If you plan to join us & haven’t yet confirmed your place, email asap. We are meeting at Voluntary Action Islington, 200a Pentonville Road (near the junction with Killick St, next to Cycle Surgery), N1 9JP (King’s Cross tube). There will be plenty of time to share news and ideas and a simple vegetarian meal will be served. There is always a set of circumstances which occur, or which are created, to build the climate in which genocide can take place. Find more events on the HMD website. Denial, a film about the legal case surrounding Holocaust denier David Irving, opens in London next week. London’s faith communities are open and welcoming! In step with the Mayor’s #LondonIsOpen message, a short film has been shot on location across the capital and includes Sikh, Quaker, Jewish, Islamic, Hindu, Christian, Buddhist & Baha’i places opening their doors. Against a backdrop of international tensions and increased hate crime, London’s faith groups, from humble to grand, are not closed and fearful – we remain open and welcoming! Inter Faith Week events across London are screening the new film as part of their activities – you are welcome to do the same by using this link. Can you identify the different places? Thanks to everyone who responded to our email during the summer and welcomed in the cameras – we were overwhelmed with offers. A big thank you to Rosalind Parker and Jack Jeffreys for the filming. For any who would like to get involved in the next stage, our #LondonIsOpen initiative continues – join us at 3pm on Tuesday 6 December at Collaboration House, 77 Charlotte Street, W1T 4PW, to plan for 2017. Let us know if you’d like to join us. Hustings and other election events (some of them this week) are listed here. Monday 20 April 5.30pm – 7.30pm Peace Café at Collaboration House, 77 Charlotte St, W1T 4PW. 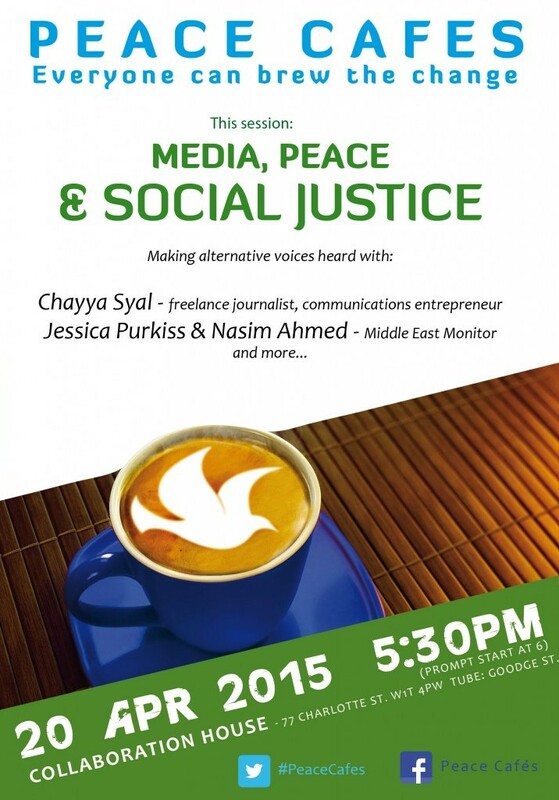 Topic this month is “the media, peace and social justice“. Bring a little food to share. Wednesday 20 April – last day to register to vote in the General Election. Download Westminster Faith Exchange’s briefing here. Wednesday 22 April 9am – 10.30am Security Briefing at New Scotland Yard for places of worship and religious & belief communities. Wednesday 22 April 6pm Near Neighbours Funding Workshop at the Khalsa Centre, 95 Upper Tooting Road, London SW17 7TW. Friday 24 April 8.30pm Immigrant Diaries “Statistics don’t tell the story of immigrants; people do.” Guest comedians and entertainers share their stories of immigration at the Southbank Centre, SE1. £10. Saturday 25 April 10am – 2pm Southwark Multifaith Health & Environment event at Southwark Carers, Walworth Methodist Church, 54 Camberwell Road, London, SE5 0EN, to learn more about plant based living. Wednesday 29 April 2:30pm Faithful Friends (Richmond upon Thames) ‘What is Humanism and the Changing Religion and Belief Landscape in Britain‘ Talk by Jeremy Rodell in Room 2008, second floor, John Galsworthy Building, Kingston University, Penrhyn Rd Campus. 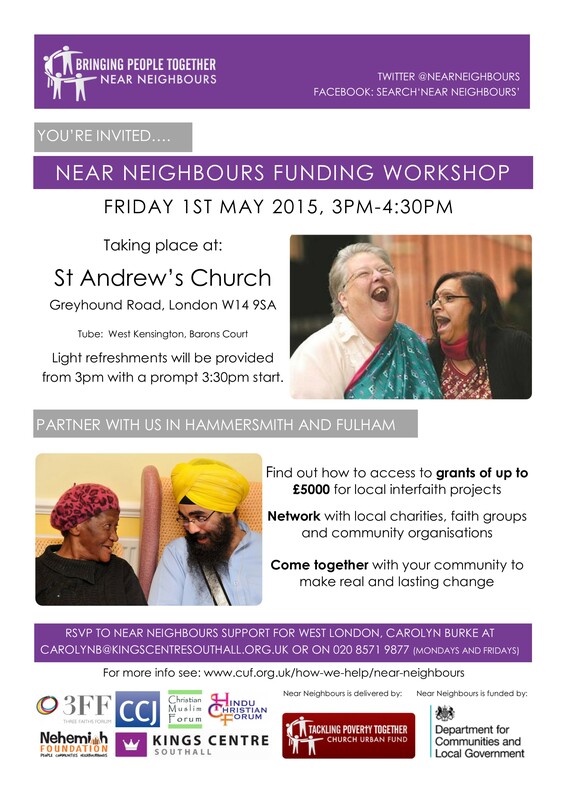 Friday 1 May 3pm – 4.30pm Near Neighbours Funding Workshop in Hammersmith & Fulham at St Andrew’s Church, Greyhound Road, London W14 9SA. Download flyer here . Tuesday 5 May 6.30pm Pre-election Frontline Film Club (18-30s), focusing on hot topics from the election campaign at Collaboration House, 77 Charlotte St, W1T 4PW. Friday 8 May 10am Beyond Collaboration: co-creating the new at St Ethelburga’s Centre for Peace & Reconciliation. £48. 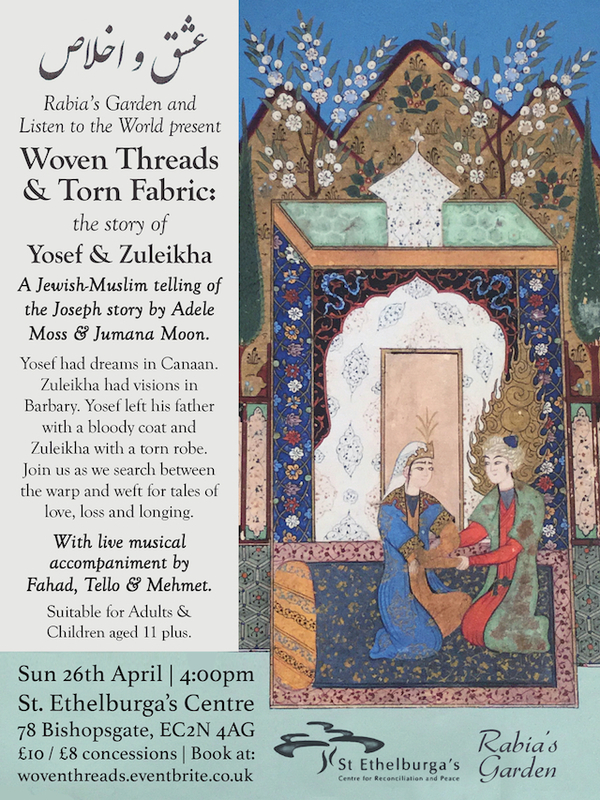 Sunday 10 May 9.30am – 4.30pm Repairing the Earth: A Jewish Muslim Response. An-Nisa Society in partnership with the Leo Baeck College invites Muslims and Jews to a text-based workshop. £30. Details and registration here. Sunday 10 May 8pm Council of Christians and Jews presents Nostra Aetate: More Sentiment Than Substance? at JW3, 341-351 Finchley Road, London, NW3 6ET. Wednesday 20 May 4pm Westminster Cathedral Interfaith Group at the Hinsley Room, Morpeth Terrace, SW1. Sally Reith of Shared Interest on investing in a fairer world. Thursday 28 May Camden’s Bridge The Gap, a new designated day to bring people together. Wednesday 3 – Saturday 6 June New drama by Ambreen Razia Diary of a Hounslow Girl at Oval House Theatre, Kennington, Lambeth. Saturday 6 June 10am – 4pm Hounslow Friends of Faith Walk of Peace and Friendship. This is a conference for those of us working with our local councils, NHS and other public agencies. By bringing the experience and expertise of our local communities together with those of the statutory bodies, we can co-design and co-produce public services that make a big difference to people’s lives, that use public money more effectively and which tackle the inequalities we are all aware of. If your faith forum, church, temple, Islamic centre, synagogue or gurdwara is working with (or interested in working with) your local borough council or NHS, please come along. WCEN’s CoProduction Research Conference is on Monday 20 April at Springfield Hospital in south London (Tooting Bec tube) & is open to religious and community groups from across London. One of the workshops is tailored especially for those of us who are interested in getting started on making a contribution to the physical health & emotional wellbeing of our communities. Professor John Benington (University of Warwick) is a leading thinker in the future of how public services are evolving and will be speaking on “mobilising movement for whole system change in times of volatility, uncertainty, complexity and ambiguity”. The day will finish with a conversation between Prof Benington and Wandsworth Council’s Chief Executive, Paul Martin. 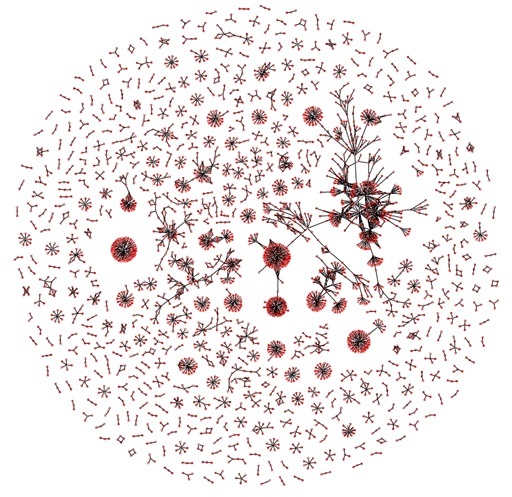 It’s an opportunity to share ideas from across systems and social networks: academics, policy makers, public servants, local religious & community organisations. The conference is free of charge and includes lunch. Download the invitation and the programme and email nadeene@wcen.org if you plan to attend. London Boroughs Faiths Network is an active, informal network of people from local religious and intercultural groups in London promoting social inclusion, religious harmony and learning. We share our experience and expertise in working with public agencies (borough councils, police, NHS) and academic institutions to make a positive impact on the lives of our local communities, particularly those who rely on public services. Our areas of interest include health and wellbeing, peace building, links with Europe, crime, safety and resilience, intersectionality and multifaith spaces. Keep in touch through the blog, Facebook, Twitter or via email. Let LBFN come to you. Enter your email address to subscribe to this blog and new posts will be delivered to your inbox. Your email will not be passed to anyone else. If you’d like to join us at the next LBFN meeting, contact LBFN’s Convener . You will be very welcome. Membership is free. Email LBFN's Convener and we will get back to you. LBFN is a broad network promoting social inclusion, religious harmony and learning. We welcome people from many different walks of life. Inclusion of groups & individuals (and their contributions) at our events or online does not imply endorsement or validation by LBFN. Want to publicise your event, publication, job opportunity? Leave a comment or email LBFN's Convener and we'll add it to the blog. During 2012, LBFN brought together a dynamic and broad-based group, the London Peace Network, to support the Olympic Truce. A very wide range of peace-building activities has taken place, including a "twinned" UK-Pakistan project and the London Peace Conference in September 2014. Visit the London Peace Network blog for the latest news.